A big-time star with an attitude, Selena Quintanilla Perez was born in Lake Jackson, Texas, on April 16, 1971. 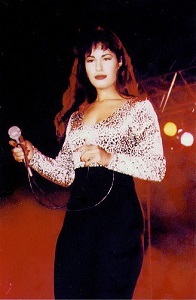 She began performing as a child and, by the age of 10, became the lead singer in her family band, "Selena y Los Dinos". This musical group started playing at weddings and clubs in Texas. Backing up Selena's vocals, her brother Abraham played the bass guitar and her sister Suzette was on the drum, while her father Abraham, a former musician, managed and produced their music. Selena became very well-known with fans of the Tejano music. She won “Best Female Vocalist of the Year” and “Performer of the Year” at the 1987 Tejano Music Awards. Selena then took a break from her stressful work schedule to marry Chris Perez, her new band’s lead guitarist, that April. Unfortunately, because of Selena’s unforeseen death, their marriage only lasted for a short period of time. Selena died on March 31, 1995 in Corpus Cristi, Texas. She was shot by Yolanda Salvidar, the president of her fan club. Saldivar had been managing Selena’s boutique in San Antonio, where she was about to be fired for stealing money. After murdering Selena, Salvidar went to jail and received a life sentence at Gatesville Prison in Texas, where she was placed in isolation. Selena was a great inspiraton to her family, friends, and fans. Despite her tragic death, she continues to be loved by many. She will always be remembered for her humble beginnings and passion for music.